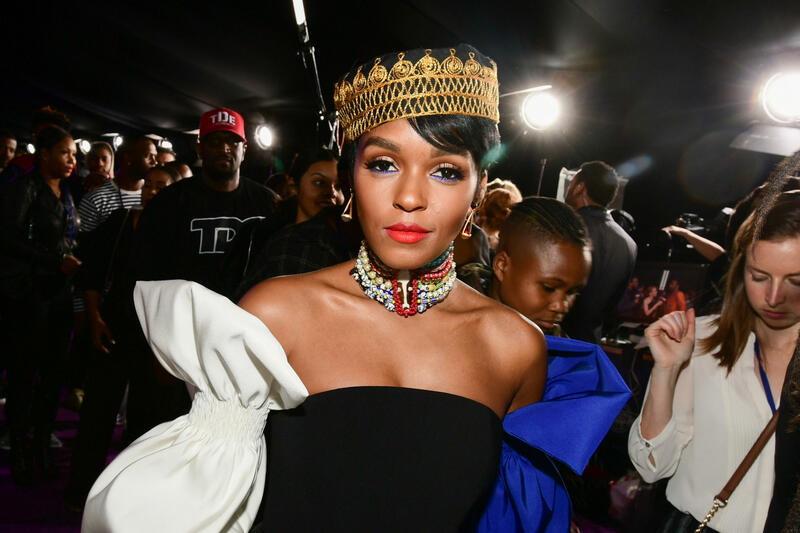 Janelle Monae attends the Hollywood premiere of Black Panther in January 2018. She was named trailblazer of the year at Billboard's Women in Music awards, woman of the year by Glamour. She came out as pansexual in a sprawling Rolling Stone cover story. And her album Dirty Computer, released this spring with a companion film — sorry, "emotion picture" — is Grammy-nominated for album of the year and can be found on practically every major list of the best albums of 2018, including ours. Dirty Computer was named NPR Music's No. 1 album of 2018, in part because of its message. As one staffer wrote, the songs take place in "a vivid dystopian world where anyone deemed 'dirty' is hunted and chemically lobotomized, or 'cleaned.' In this totalitarian world of Dirty Computers, not unlike the divisive reality of 2018, nonconformity can spell extinction if you don't fight back. With every guitar riff, every interlude, every moment of loving, queer affection, Monáe fights." Janelle Monáe joined NPR's Ailsa Chang from the Atlanta studios of her entertainment company, Wondaland Arts Society (whose film division recently entered into a production agreement with Universal), to talk about her process, her plans and why Dirty Computer could only have been written now. Hear the radio version at the audio link, and read on for highlights — including some moments that didn't make the broadcast. Dirty Computer was supposed to be the album that came out before my first album, The ArchAndroid, [but] I felt like I needed to live more. It started to really make itself once I got my mind and my spirit fearless enough to dig deep and have conversations with myself. One of the things that I felt was happening was, I was writing music only when I felt great. It was like, you go into the studio, and I want to go in when my heart is clear, when I know what I want to say. I got to point where it was crippling me, this idea of perfectionism, and it stopped me from writing for a minute. And what I decided to do was take some time. So when I wrote this album, it wasn't about perfection. It was about the imperfections. It was about embracing all those things that make you unique, even if it makes your own self uncomfortable. On the song "So Afraid"
For me it was about my love and hate relationship with this country. I love being American, I love being born here and having roots here. But there are some really evil things that have happened and continue to happen. And it speaks to being afraid of forgiving. I think of being hurt again, or being manipulated, or not fully standing my ground. And forgiving myself, also — you know, it's two parts. It's about being able to love yourself through it all, being able to love where you are right now, and to give yourself permission to forgive yourself when you make mistakes, when you let other people down. The album is broken up into three parts. The first few songs represent the reckoning — reckoning with what it means to be called a n***** for the first time by a white person, or being called a b**** for the first time by a man. And then you have the middle section, where "Pynk" falls in, and songs like "Make Me Feel," that are celebratory of sexuality and of womanness. The latter part of the album deals with the reclamation: A song like "Americans" is about reclaiming what it means to be an American. My ancestors helped build the White House, helped build this country. And it's not time to run away, it's time to stand your ground and confront what I call the great divide — those who seek to divide us and highlight all our differences and make us fearful of each other. There's so many stories out there. If I look at a Moonlight -- a movie that I was extremely excited about being a part of — having a young, gay, black boy highlighted in the way that Moonlight highlighted his voice and story, I'd never seen in cinema. Even with Hidden Figures, another film that I was really honored to be a part of, I didn't have any idea about those women who helped get John Glenn into orbit, or the human computers who were doing all the numbers that it took to get our astronauts into space. So I'm just looking for those unique stories. There are a lot of other people that I respect and admire, like Issa Rae and Lena Waithe and Jordan Peele, who are who are also pushing forward underrepresented voices. I just hope, and Wondaland hopes, to continue to push culture forward and and redefine how we are viewed. I want to make movies the dirty computers can feel proud of. It feels like when you get off from school early in the first grade and your grandmother takes you to get ice cream, and you eat ice cream all night and you don't have a tummy ache, and then you get to go to the amusement park all by yourself. It's unexplainable, but it's very humbling — that word keeps popping up in my mind, and in my heart. 2018 has been a good year for Janelle Monae. She was named Billboard Women in Music's trailblazer of the year, Glamour's woman of the year. Her album "Dirty Computer" is Grammy nominated for best album of the year. It can also be found on almost all the best albums of 2018 lists, including ours here at NPR. JANELLE MONAE: (Singing) Dirty computer breaking down, picking my face up off the ground. CHANG: We named it best album in part because of its message about what Monae calls dirty computers - people who've been told they don't belong. MONAE: Those who are told that the things that make them unique like their identity and where they come from are bugs and viruses, and those bugs and viruses need to be cleansed. CHANG: She says as a queer black woman, she considers herself a dirty computer. And this album explores what it feels like to both own and fight back against that label. I talked with Janelle Monae earlier this week, and I started out by asking her what this year felt like for her. MONAE: It feels like when you get off from school early in the first grade and your grandmother takes you to get ice cream and you eat ice cream all night and you don't have a tummy ache. CHANG: What do you think "Dirty Computer" reveals about yourself that's different from your earlier work? MONAE: Well, "Dirty Computer" was supposed to be the album that came out before my first album, "The ArchAndroid." And I felt like I needed to live more in order to make this album. Then it started to really make itself. It really started pouring out - the lyrics just like rain. MONAE: (Singing) I am not American's nightmare. I am the American dream. CHANG: What did you find? What spilled out of you? MONAE: Well, one of the things that I felt was happening was I was writing music only when I felt great, you know? It was like, OK, you go into the studio. You know, I want to go in when my heart is clear, when I know what I want to say. And I got to a point where it was crippling me - this idea of perfectionism. MONAE: And so it stopped me from writing for a minute. And what I decided to do was take some time. So when I wrote this album, it wasn't about perfection. It was about the imperfections. It was about embracing all of those things that make me unique. CHANG: It's so interesting what you say about the oppression that perfection imposes on you because your persona in your earlier music had been being this android, this perfect, automated robot. And you have said in the past that being that android let you remain in character. It gave you this sense of safety and comfort. Why is that? MONAE: There was just a large part of me that was built on this idea of perfectionism, you know? CHANG: You're speaking to another perfectionist. I totally get it. CHANG: You feel like you failed. MONAE: ...Then you feel like you failed. And so I think the thing that I think I was missing was walking in my truth so that others could walk in their truth. MONAE: (Singing) And I'm afraid. CHANG: One song where I hear you shed the android is the song "So Afraid." CHANG: What's the fear that you're expressing here? MONAE: For me, it was about my love and hate relationship with this country. I love being American. I love being, you know, born here and having roots here. But there are some things - there are some really evil things that have happened and continue to happen. And it speaks to being afraid of forgiving. MONAE: (Singing) I'm so afraid. CHANG: What are you afraid of if you forgive someone? MONAE: Being hurt again or being manipulated or not fully standing my ground. And forgiving myself also - you know, it's two-part. MONAE: ...Being able to love where you are right now and to give yourself permission to forgive your own self when you make mistakes, when you let other people down. MONAE: (Singing) I'm afraid, afraid of loving you. CHANG: When you were writing and recording this album, was there ever a moment when you were like, oh, wait; maybe I do not want to go there; that is way too personal; I am not going to share that? CHANG: That you even went that far. MONAE: Yeah, that I've gone that far. And what you hear on the project, too, is candid conversations that I would have with loved ones and friends. You know, if I'm upset and I feel like women's rights are being trampled on, then I'm not going to sugarcoat that. You know, as an artist, my responsibility is to the truth and to my truth, you know, even if folks may not agree with it. It was interesting playing the album for my parents and just people that helped raise me because they had never seen me communicate in this way. MONAE: (Rapping) Remember when they used to say I look too mannish. Black girl magic - y'all can't stand it. Y'all can't ban it, made out like a bandit. They been trying hard just to make us all vanish. I suggest they put a flag on a whole nother planet. I come from a family of - I have 49 first cousins. Like, I can't call them all up and say, hey, here's where I am in my life. So when they heard the project, it was just - it was a scary thing because I knew that I would have to go home. MONAE: (Rapping) Mama was a G. She was cleaning hotels. Papa was a driver. I was working retail. Yeah, I will say that was the scariest thing. MONAE: (Rapping) Do anybody got it? Do anybody got it? I say, anybody got it? CHANG: So at this stage in your career - I mean, you're on the top of so many lists now as a musician. You're also the boss of your creative headquarters. Can I ask what is your biggest fear right now at the level you're performing? MONAE: My biggest fear - I think one of my biggest fears is getting in my own way. CHANG: What do you mean by that? MONAE: By allowing my mind to take me in a space that talks me out of maximizing my potential. I feel like talent can only get you so far. Talent is just going to take you to a certain level, and you can stay there. But I'm not that kind of artist. I'm ready to go to the next level. And I don't want to ever talk myself out of going to that next level in the most authentic way and honest way that I possibly can. CHANG: Thank you so much for joining us. MONAE: Thank you so much for having me. I'm so honored. CHANG: That's Janelle Monae talking about her album "Dirty Computer." It was chosen as NPR Music's No. 1 album in 2018. MONAE: (Singing) I live my life in a magazine. I live my... Transcript provided by NPR, Copyright NPR.